Whether you’re a runner, cyclist or avid hiker, the risk of heat exhaustion increases dramatically during hot summer months. If you’re out for a run or climbing a mountain in the middle of the day and you feel dizzy, fatigued, have a headache or suddenly feel an increase in your heart rate, you may be suffering from heat exhaustion. According to the American College of Sports Medicine, the best way to prevent heat exhaustion is to stay hydrated and avoid exercising in extreme heat. It is also helpful to examine your clothing. Cotton is the worst material to wear in the summer heat. It soaks up sweat like a towel, holding the moisture against your skin and causing your body temperature to increase. Evaporation consumes energy, which cools the skin; the fabric of your clothing should allow sweat to evaporate. The Centers for Disease Control and Prevention recommend you wear lightweight, light-colored and loose-fitting clothing. Avoid dark colors -- dark clothes absorb the sun's heat, while light colors or white reflects light and heat. Select moisture-wicking, quick-drying gear. These fabrics are thin, lightweight and don't absorb sweat. If you are in an area of low humidity, wear loose, light-colored, long-sleeved clothing to shield your skin from the sun. Covering up has been used in Middle Eastern countries for centuries and is a proven way to keep your body cool in dry heat conditions. 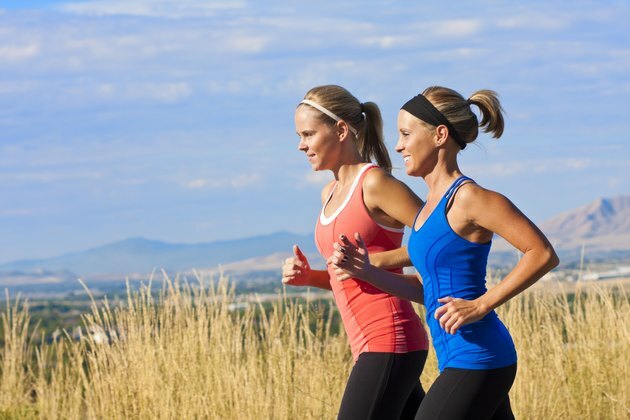 For women, sports bras are usually essential for outdoor activities. Look for bras that provide ventilation. A baseball cap or a bandanna made of cotton increases your risk of heat exhaustion. Look for head bands and hats made of polyester or microfiber that wicks away moisture. Hats should have added ventilation to allow heat to escape and sweat to evaporate. A wide-brimmed hat shields your head and neck from direct sunlight. A beneficial secondary item to have in the heat is sunscreen. Besides preventing sunburn and skin cancer, sunscreen helps reflect UV rays and can prevent your body from heating up. If you will be exposed to the sun for long periods of a time, carry the sunscreen with you and reapply it periodically. Regular athletic department stores carry just about every major brand of moisture-wicking gear. If you are looking for specific gear related to your training or activity, look for more specialized stores. Hikers and climbers are better off going to a store dedicated to outdoor sports, while cyclists and triathletes are better served in stores devoted to their sports. A knowledgeable staff that can help get you into the right clothing is worth more than a few cents saved elsewhere.